More than a few months ago I purchased BlendTec’s new Twister Jar. It’s smaller and cylindrical with a special lid that has 2 extended prongs that rest against the side of the container. As you run the blender you can turn the lid counter clockwise and it will help keep your ingredients moving and therefore blending – this means, no stopping and scraping or adding unnecessary liquids to your recipe. I have loved using mine for hummus, thick dips, raw vegan cheesecakes, and now homemade nut butters! Last night I decided to make some hemp seed butter. I have my hemp seeds (these are hulled hemp seeds, also called hemp hearts) that I usually sprinkle on salads or in smoothies but wanted to try making seed butter out of it. Having never had store bought hemp seed butter, I love it and can’t imagine ever buying it! 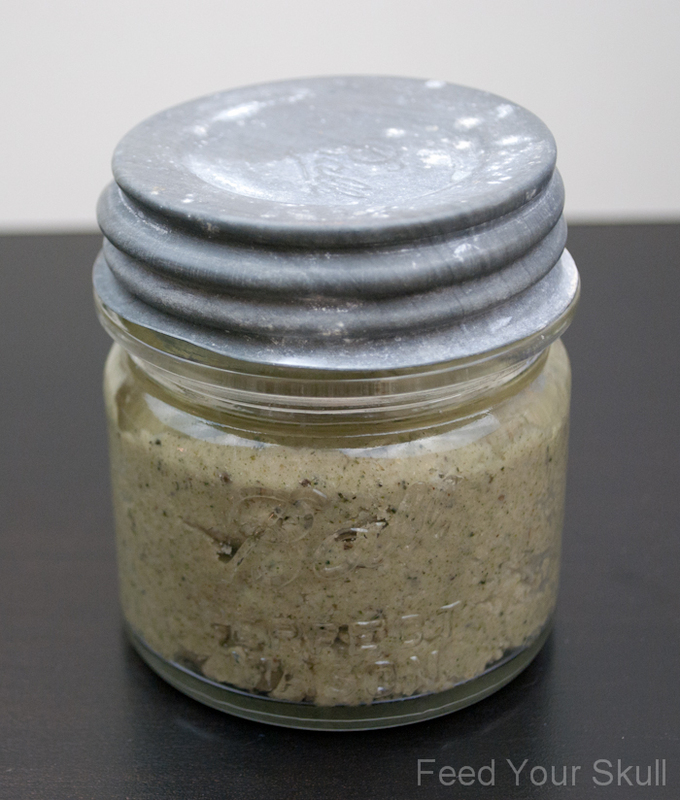 If you love hemp seeds, you will adore hemp seed butter! They are a complete protein source and very digestible, all while containing vitamins E, D, B6, B2, B1, A, and even Iron, Calcium, and fiber. Yum! Place hemp hearts in your BlendTec Twister Jar and manually increase the speed while turning the lid counter clockwise for 20-30 seconds. Store in small glass ball jar or pyrex container with lid in the refrigerator. Pour a little almond oil or hemp oil over the top if desired. Viola! I enjoyed mine on apple rings sprinkled with cinnamon this morning, delicious! You might be able to make this in a food processor but I haven’t tried it. Let us know your results, if you do. Looks great! With mine I add about a tablespoon of sesame oil (which, like the almond oil, doesn’t conflict with the nutty flavor of the Hemp seeds) while I’m processing it. This step it important to me because it makes the butter SIGNIFICANTLY more “spreadable” by emulsifying the butter. The only other affect I’ve seen is the occasional necessity to stir it up. It should also be noted that Hemp seeds have a pretty short life once broken downthis way(days) so I strongly suggest sorting this nut butter in the fridge to extend that time to weeks. I’ll have to try the almond oil and see if it’s any less song in flavor. The first time I used to much oil and it was hard to taste anything but the sesame oil. Yum! I’d love to start using this as a breakfast staple. Hemp seeds are truly versatile in the culinary world. Thanks for sharing! I tried your recipe and finally made hemp seed butter at home. It was awesome. Thank you so much.